Today was a day full of challenges, for sure. And they weigh heavy on my heart tonight and for a long time to come, I’m sure. Parenting is not a cake walk, never thought it would be or should be. 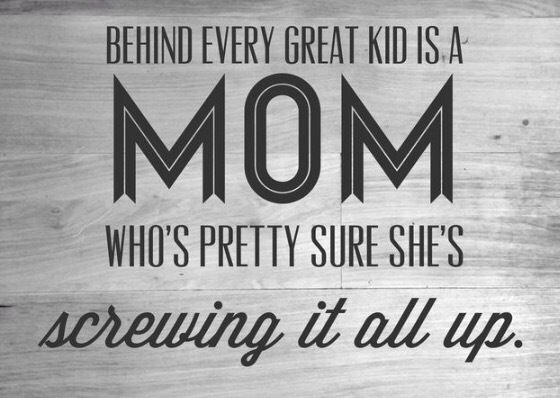 But there are times, many times when you wonder if you’re doing everything right by your kids. Ever feel like your feet are dangling, and then you don’t know that when you put your feet on the ground what direction to you’re to take? I have three amazing little people I brought into this world. Each one is so very different, and in many ways we parent each to their own individual personality. Yes there are standard principals and rules and consequences and morals we apply evenly through the home, but each child is guided based on their individual needs. Not all things are equal in this house. And right now, I’m struggling with that with regard to the challenges we currently face. I had a parent teacher conference with ALL of my son’s teachers today. I was mortified by the fact that I actually started crying. Yes, during the conference. Dammit! Now, it’s not like what they were saying was incredibly horrible, at all. It’s because he has a problem and I, as a parent, was not sure in those moments in front of these people, how I was going to help him. Hence, the waterworks. All three of my kids-each one with very very different learning abilities-have their father’s genetics of having ADD. Behavior has never been an issue for any of them. My son might be a bit hyperactive, but it’s more related to his self control abilities and not disciplinary behavior issues. He’s a good kid and the teachers reaffirmed that to me today. He’s respectful, polite, compassionate… and brilliant. I don’t say that beilliant part because I’m his mom, trust me-but my daughters, me, my husband-all of us are in a totally different ball field than him when it comes to his brain. The reason for my heavy heart tonight is not because of his problem, per se, but because of the measures my husband and I are taking to hopefully alleviate some of the contributors to his problem in an effort to help him take control (sans medication). Special diet, chiropractic care, and quite possibly home school so he can control the environment he so desperately needs to control…(that’s him – not us or the teachers, it is actually his number one issue). I’ll save you the details because it would take a page or 5 to describe my sons personality and inner workings. That’s not the point tonight really. What about the diet changes and chiropractic care? We didn’t even talk about that for my daughters. Why? Why are we not talking about those things for them too?! They each require very different ‘treatment’ options- they are not the same and this cannot be equal. But drastically changing their diet and taking them to a chiropractor renowned for improving the afflictions of ADD-those are just basic home-grown medicines we can give to all three of them to help, right? To minimize the battle they fight every day in school as much as we can-so they can learn better in school. We can make these changes throughout the household easily, expense ignored. And see if it actually does help one or all three of them. It can’t hurt to try for all of their sakes, surely… This one can be created equal in this house. Will it help, I don’t know. My son will/does give 100% honing in on himself to take ADD by the balls without medication, which he vehemently opposes and we respect that (he is 13 and has a mind to determine that for himself). But what about my girls? My oldest has tried the no-medication route and it is not for her. My youngest is in the midst of evaluation so we dont know if that’s a tool for her yet. So I think that this has to be equal in this house- the diet and chiropractic care. Maybe the girls can be medication-free too, who knows. That would be like diamonds falling from the sky if that were the case. I don’t like medication for my children. But suffering from my own affliction (bi-polar) and seeing the positive change in my life because of medication, I can’t discard the value in that for my kids own afflictions either. It’s a very tight rope we walk on the subject. And one we take very seriously. All things in life are not created equal. Parenting is no different. But this one, this one might help all of them. Advise is welcomed, especially with regard to homeschooling in which I have just begun researching. Bashing is not, so I thank you for not doing it here. Posted on January 6, 2016 by AmandaPosted in Bipolar, Family, Musings, SupportTagged ADD, Homeschooling, Medication, Parenting. You’re facing a lot, but trust your instincts. You’ll figure out what’s right eventually, and since he’s 13, he can have a lot of say in weighing the options once you’ve narrowed down what things could work for him/your family. I wouldn’t jump ship on public school for homeschooling just yet (though I’m huge on the benefits and only put my oldest, who is on meds due to her early onset bipolar/mood disorder, in public school due to a series of family traumas and me being unable to keep her home for a period), but she has thrived. I feared she wouldn’t be challenged enough because of her high IQ (unbiased, but proven), yet socially she has benefited significantly. By summer, my feelings may change, but to have seen her in both settings has benefited us greatly. Maybe try it for one year if he’s game? There are so many choices we face. It’s never easy and I commend you for even being consciously aware of the numerous obstacles that come with your options. You’re not alone in having cried in front of school personnel; in a recent conference with the principal and para and social worker and school psychologist, etc., I burst into tears from the overwhelm of a room filled with people genuinely giving a d*mn about my child’s best interest. It was embarrassing, but I reasoned that it really shows when we’re physically drawn to tears trying to do what’s right by/for our precious little ones. Regardless of what you choose, you clearly adore him, respect him, and only want what’s best for him, so he’ll be all the better that you’re making decisions for/with him, and in the long run, he will go far with the guidance you gave him, that there are many different options/solutions, and if one isn’t working feel free to go a different route, or another, or another, or another. Maybe the best thing you can do is teach them why it’s alright for things to not be equal? I don’t know…but…hope my belief in your supreme parenting is at least a little comforting. You know what you’re doing beneath it all, and everyone will be fine 😉 Best of luck! Thank you so much! Yes I’m doing a lot of research so hopefully will have some more ammo in my Arsenal soon. I have taught and/or worked in Special Education for about 24 years. Every kid is different. What you do for one is not going to be for the other. My two boys are vastly different. Both are ADHD. They took medicine from kindergarten until about middle school. It gave them enough time to get their educational foundations and then we worked on self control and coping skills. When they were ready (both at different times) we weened them off their meds. It’s been tough but it has worked. One son is crazy smart and the other is smart but also dyslexic so again… vastly different issues. But we are doing good this year. Oh… I thought I would mention a program I have been using in our school district for two years and my own niece used the program as well… It’s the DORE program. I want to use this with both of my boys but we have not gotten around to getting it put into place just yet. It’s pretty amazing. It works on getting the cerebellum and the cerebrum to communicate and work together better. It works to improve your attention, focus, skill acquisition, social skills, etc… I mean it’s pretty awesome. Google it. They have a website. They also have videos on YouTube. It’s worth a look. I’ll definitely check it out thank you!!! Thank you! Yes my son is not on meds but my oldest is. And we’re likely to put my 4th grader on the meds until/if she can handle being off of them once in high school. She has learning struggles as well, although not as challenging as dyslexia. Only reason we can even think of homeschool as an option is because I work from home now. Makes me wonder if God put me on this path because this may be the best choice for my son. He could be very independent of me for his education and even go above and beyond with supplement courses just because he wants to-so I would not have to guide him during the day. I’m sure I will keep update posts periodically… Hugs! Glad you shared and so pleased you got such lovely and warm feedback. W.P really does like to help!